Over the last couple of years cleansing brushes have become extremely popular. Only recently have they become more affordable. I’m so grateful & lucky that Magnitone sent me a ‘Dazzling blue’ Lucid to try out. 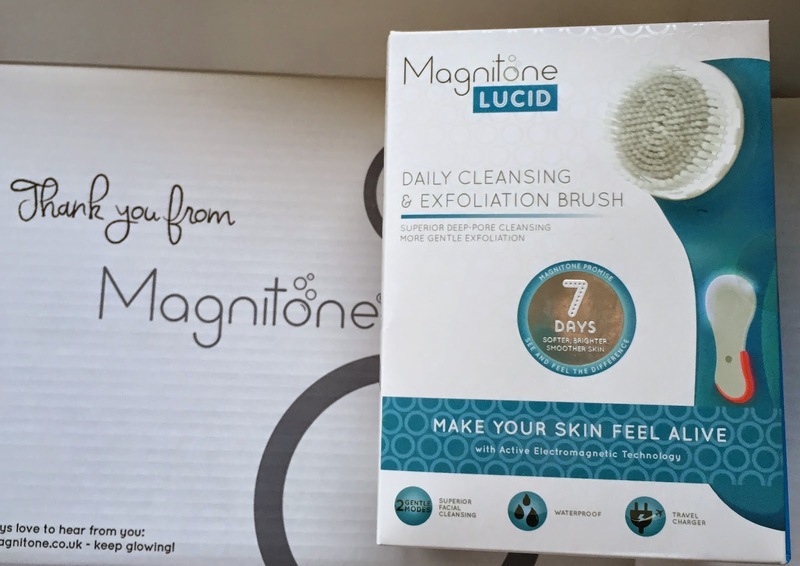 A few weeks ago I took part in the Bloggers Love Hub #BHTwitterParty, where Magnitone were giving away Lucid cleansing brushes to bloggers to try & review on their blogs. I was over the moon that I was picked to try out a Lucid & I even got to pick what colour Magnitone Lucid that I wanted. Thank you so much Magnitone!!!! Check out Magnitone’s website for some AMAZING products https://magnitone.co.uk. As I have only had the Magnitone Lucid less than two weeks I’m going to do a first impressions review. In 2-3 months I will do an update & will tell you how I’m getting on with using the Magnitone Lucid. I have never owned a cleansing brush & for the last two years I have really wanted one. I chose the ‘Dazzling Blue’ Lucid which is a gorgeous colour. There are four colours to choose from. The colours are Plush Pink, Aqua Green, Dazzling Blue, Sunshine Yellow & there is also a limited edition Pixie Lott Lucid which is a hot pink colour. 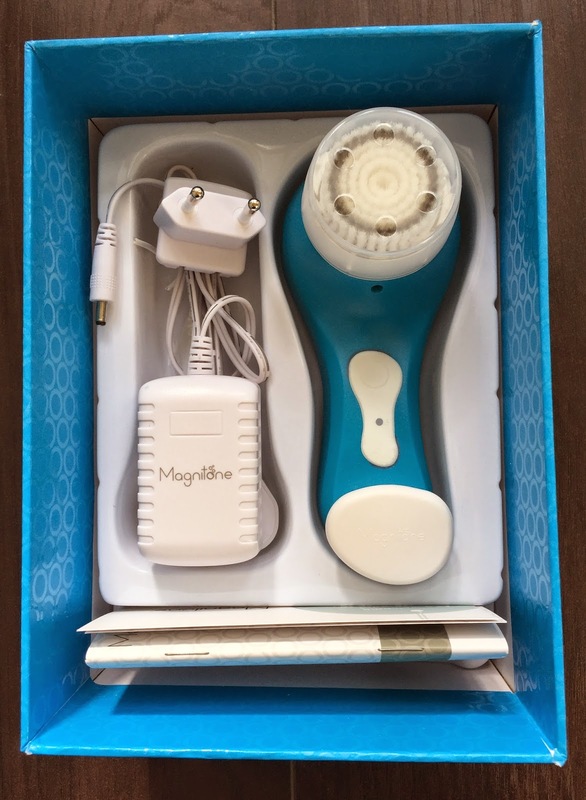 A Magnitone Lucid costs £69.99 if you want to buy a Magnitone Lucid I have a 20% off discount code which is Rosalind20 https://magnitone.co.uk/our-products/magnitone-lucid-cleansing-brush/. I couldn’t wait to unbox the Magnitone Lucid!!! When you open the box you will see everything you need to get started. I love Magnitone’s packaging & think its designed really well. In the box you get an Instructions manual, 12 month warranty card, Lucid, cleansing brush, clink charging unit, charger plug & a two pin charger attachment which you use if you go abroad on holiday. 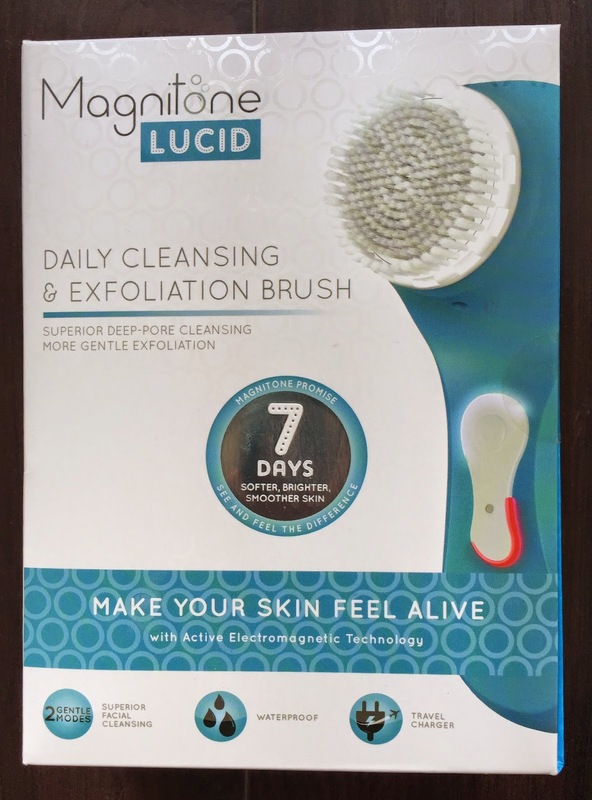 Magnitone claim that using the Lucid cleansing brush can give you softer, clearer and brighter skin in just 7 days!!! I took the 7 day challenge & was really impressed with the results. I would definitely recommend the Lucid to anyone with sensitive skin. I thought people with sensitive skin couldn’t use cleansing brushes, because I thought it would be too harsh on your skin, but I was wrong. The Magnitone Lucid is actually quite gentle on your skin. The Lucid has two cleansing modes deep clean & sensitive. I didn’t notice much of a difference between the modes, but the sensitive mode must be more gentler on your skin. The cleansing brush is meant to remove make-up, deep pore impurities & exfoliation of dry patches. After the 7 day challenge I have definitely noticed a difference in my skin. My skin feels even more softer than it normally is & my skin looks clearer. I can’t wait to see what my skin will look like in a month or two. I have been using the lucid every night before I go to bed for one minute. I have been using my Liz Earle cleanser which is quite a thick cleanser. After using the Lucid I clean the brush head thoroughly. I think I will use a small squirt of baby shampoo to clean the brush head monthly. Magnitone say that you’re meant to replace the brush head every 8 weeks. Most of the replacement brush heads come in a pack of two & cost £15.99. There are lots of different brush heads to choose from https://magnitone.co.uk/product-category/accessories/. The one accessory that I will definitely buy is the Lucid travel case https://magnitone.co.uk/shop/magnitone-lucid-travel-case/. The travel case will be perfect for storing my Lucid & keeping it safe. 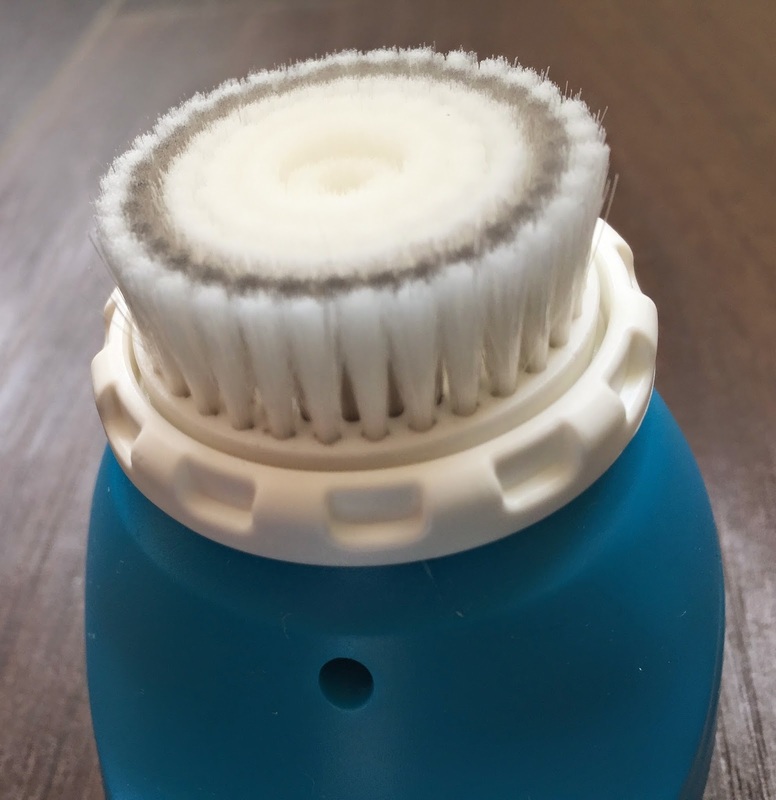 The travel case is made out of mesh allowing an air flow, which prevents bacteria growing on the bristles of the brush head. Another great thing about the travel case is that there is enough room to store the charger plug & clink charger unit. The way the Magnitone Lucid charges is really clever. In the above photo is the Magnitone clink charger unit, which magnetically attaches onto the Lucid. Then all you do is plug in the charger cable into the clink unit & your Lucid charges. This means once your finished charging the Lucid you take off the clink unit & the Lucid is 100% waterproof, because the Lucid doesn’t have any electrical charger ports it means you won’t get electrocuted. You can use the Lucid anywhere you want in the shower or bath. I think its really incredible the way the Lucid charges & think its excellent how you can have a product that is 100% waterproof!!! 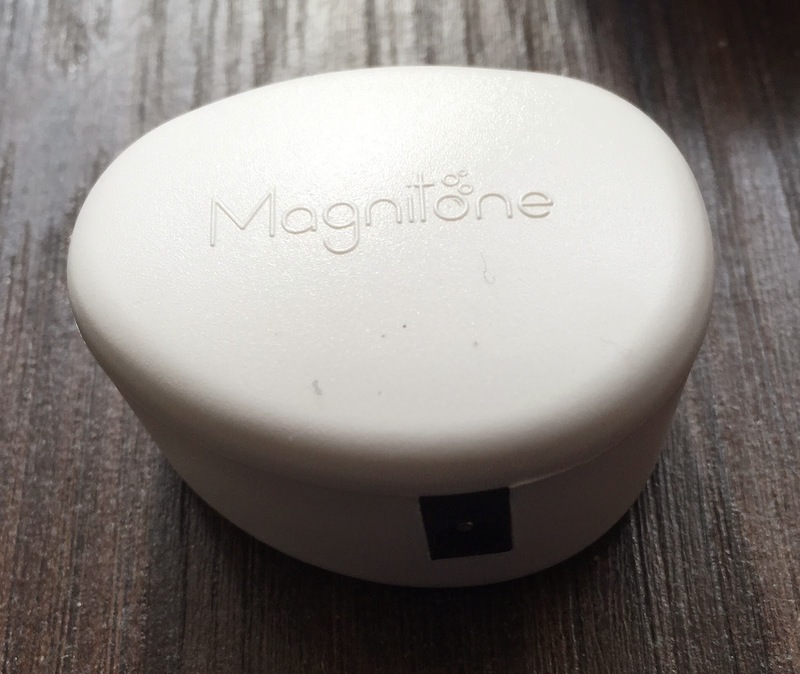 If you loose you clink charger unit you can buy a spare from the Magnitone website for £15.99 the price includes the AC power adapter & the EU two pin plug adapter as well https://magnitone.co.uk/shop/magnitone-lucid-replacement-clink-charger/. I loved sampling the Magnitone Lucid!!! I’m going to be giving the Dazzling Blue Lucid to my brother as he has really bad acne. I think the Lucid will really help his skin & hopefully he will end up with a clear completion. I’m so impressed with the Lucid. I’m going to buy the limited edition Pixie Lott Lucid & I’m going to be purchasing two travel cases as well for me & my brother. If you were lucky enough to try out the Magnitone Lucid leave me a comment & tell me what you thought. If you already own a different cleansing brush leave me a comment & tell me how yours is different. If your thinking of buying anything from Magnitone don’t forget to use my 20% discount code Rosalind20.